Going on a fishing adventure can be an awesome trip for you and your family or friends. It can seem easy enough to just go fishing anywhere but going on a truly amazing fishing trip can really create an amazing experience. The ideal fishing adventure will take you somewhere exotic and provide you the tools that you need to fish. A guide will take you through the lake and help you and your friends enjoy a fishing and fun on the open lake. Summer is finally here! Now is the perfect time to take family vacations, a fishing trip with friends, or relax on the beautiful shores of Lake Texoma. Lake Texoma is the ultimate summer destination. Considered one of the tenth largest lake in the U.S., Lake Texoma is lined with miles of white sandy beaches providing fun for all ages. The lake is home to fishing hot spots, boating activities, and more. Dine at Pampano’s Waterfront Bar & Grill at the Highport Marina or enjoy a round of golf at one of Lake Texoma’s golf courses. Go for a ride on the Lake Texoma Belle Paddlewheel boat or catch striper fish with a guide from Adventure Texoma Outdoors. Whatever you choose to do you will have an exciting and memorable trip at Lake Texoma. What better way to celebrate a long weekend than relaxing lakeside fishing with close friends and family? Lake Texoma is the one of the largest lakes in the United States and an ideal spot to spend a relaxing vacation. Lined with white sandy beaches and beautiful trees spend your afternoons having a picnic by the water or relax in the sun. Situated next to two state parks and wildlife refuges, it’s a great place to enjoy the outdoors and be one with nature. In the spirit of Memorial Day visit President Eisenhower’s birthplace or Fort Washita, a civil war fort. Don’t forget to participate in Lake Texoma’s most known attraction, striper fishing. Lake Texoma Adventures offers incredible fishing experts to guide you and show you the ropes while you’re fishing. To book your vacation now, visit Adventure Texoma Outdoors today! February 14th places a lot of pressure on the man in the relationship. Switch it up this year by planning the perfect outing for him. Here is a guide fit for the guy who loves the great outdoors. Golfing- Plan a day where your guy can hit the links. Go with him to have a couples day where you can both participate in the fun. Not an avid golfer yourself? Have fun with some mini-golf. 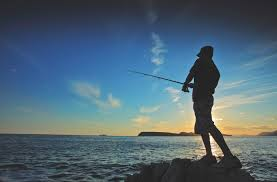 Fishing Trip- A relaxing day on the water is what your man might need to unwind. A guided fishing trip can be perfect since your guy can fish while a guide help if you are new to the world of fishing. Hiking- Spend the day exploring the wilderness with a local hike. Don’t forget to pack a delicious lunch for a romantic picnic stop along the way. At Lake Texoma, there is a fishing guide that is perfect for a romantic day on the water. Schedule your trip with Adventure Texoma today. Stick to fishing lower or higher water. Fish like bass tend to stick to shallow water for food or head into the lower water. If the water is clear, stick to deeper water and shallow water when it is murky as bass will use dirty water as camouflage. Fish slow as to not startle the fish and use bait that will move slowly in the water. Rather than struggle, seek the assistance of a professional angler. Texas residents can look to Captain John Blasingame at Adventure Texoma Oudoors.